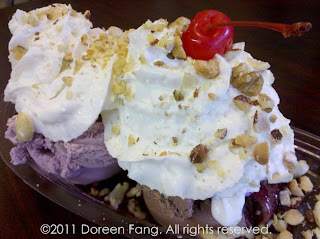 Every time I'm in Alhambra...I always have the urge for ice cream at Fosselman's. I have no shame...I go in by myself all the time...since I'm usually running around by myself. Once in awhile my friend Alison or her mom Auntie Norna will go with me which makes it even more enjoyable, but truly, I can enjoy ice cream on my own. One time, I was there with Ali and Roy, and we ran into my friend Ryan Cross the jazz musician who lived near by...and he came in on his own just to enjoy a tasty sundae! This ice cream isn't super rich like Haagen-Dazs, but it's just tasty and delicious. I like the Dutch chocolate, blueberry and now wild mtn black raspberry thanks to Auntie Norna. Here's my usual Dutch chocolate cone I get almost every time I go. Doesn't it make you wish you could reach out and take it from hand and lick it?! She was the one who made the black raspberry, raspberry sauce sundae and it was so delicious...but since I normally get the Dutch chocolate, I thought that would be a great combo. I just wish I had more raspberry sauce! Anyhow...you all know that I'm a huge ice cream freak! 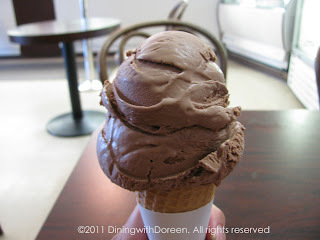 And for all you ice cream freaks out there...raise your cone or spoon and let's get eating!! I have such good memories of Fosselman's ice cream. I've actually never been to the shop, but whenever we would visit Auntie Aida and Uncle Daniel, they would always have those plastic buckets of it in their freezer!